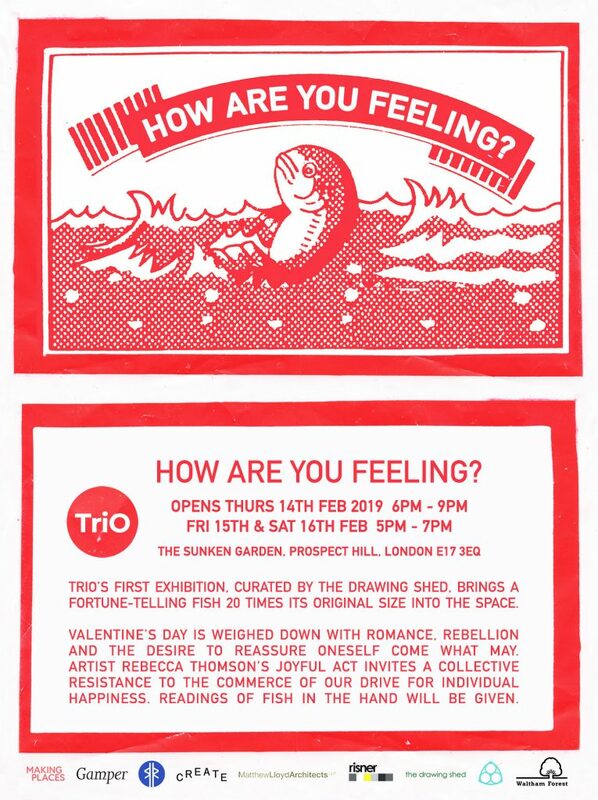 Please join us for the opening of HOW ARE YOU FEELING?, the drawing shed’s first exhibition curated for *TriO on February 14th at 6pm – 9pm in The Sunken Garden on Attlee Terrace, Prospect Hill, Walthamstow, London E173EQ. St Valentine’s acts of resistance required the participation of hundreds of young men and women, as husbands and wives-to-be, in the ritual of marriage outlawed by the state during a time of war, all of which were carried out in secret under this reactionary radar. HOW ARE YOU FEELING? is a tongue-in-cheek reference to our inclination to seek out reassurance and guidance from potentially unreliable sources: from a faith in horoscopes and fortunes, to religious-come-commercial festivals, and a melé of media…It is a last-ditch attempt to make us all feel better on Valentine’s Day during a period of significant (European!) history. Artist Rebecca Thomson’s work HOW ARE YOU FEELING? is a joyful response, with a serious edge, to the age old problem of just how happy can a person actually be? Let us resort to collective readings of the fortune fish placed in the hand to find out. HOW ARE YOU FEELING? brings a giant red cellophane fish into the new TriO. A perfect partner to the red LED lit store attached to the new Pavilion, the garden will be humming with the glow of individual possibilities and collective intention to counter late capitalism’s manipulation. Rebecca Thomson is a young artist, a winner of the UK wide 2018 Woon Foundation Prize and part of the RSA New Contemporaries 2019.For the exhibition, Thomson will be sharing a new zine work made at Rabbits Road Press with O.O.M.K at Rabbit Road Institute, a space in Manor Park for artists and community to come together, curated by Create London. * TriO is a new cultural space made possible by LBWF’s Making Places initiative, sitting in an un-gated community garden on Attlee Terrace housing estate in east London, Walthamstow E17, TriO was commissioned by the drawing shed and designed and built by Risner Design with collaborative support for the process from Making Places WF, Matthew Lloyd Architects, Sahra Hersi and producers Create London.